The Alliant Energy’s Marshalltown Generating Station in Iowa is the recipient of the Envision Platinum award from the Institute for Sustainable Infrastructure (ISI). The facility is the first in Iowa to earn an Envision sustainable infrastructure award. The Envision system rates the sustainability of infrastructure projects across the full range of environmental, social, and economic impacts, and the Platinum award is the highest attainable Envision recognition level. “We are proud to receive the Envision Platinum Award for our Marshalltown Generating Station project,” said Doug Kopp, president of Alliant Energy’s Iowa utility. “The facility advances clean energy for our customers and communities, while significantly reducing our environmental footprint.” The Marshalltown Generating Station is a natural gas combined cycle facility. It has a 650-megawatt capacity, providing enough electricity to power 500,000 Iowa homes and businesses. The generating station will emit less than half the carbon dioxide, about two-thirds less nitrogen oxide and roughly 99 percent less sulfur and mercury compared to the traditional coal-fired generation. “Envision definitely helped our project team design and deliver more sustainability and economic benefits in the development of our Marshalltown facility,” added Kopp. 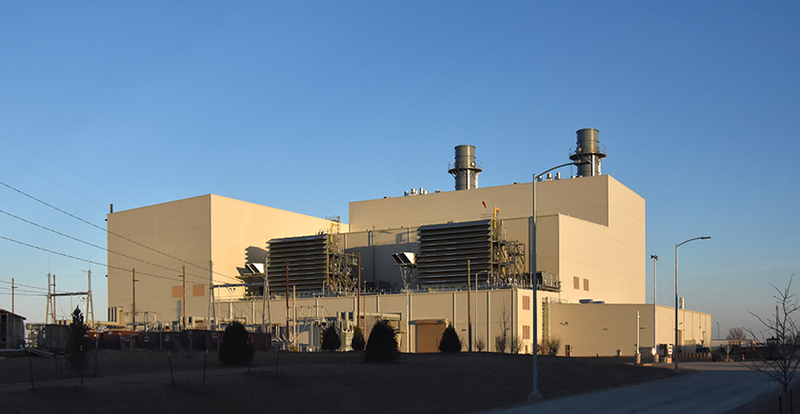 “The system guided and enabled us to add several environmentally-friendly features to our construction and site plans.” Alliant Energy worked in close collaboration with HDR, a leading architectural, engineering and consulting firm, to deliver the Marshalltown Generating Station project that resulted in an Envision award. Quality of Life: The Marshalltown Generating Station created a significant number of jobs during the design, construction and operational phases. During construction, an average of 650 jobs were created with nearly 40% of these workers from Marshalltown, and the remainder commuting from nearby cities and towns. These new jobs brought significant revenue to local businesses, including hotels, restaurants, and other stores. With the generating station now complete, it is employing roughly 20 permanent employees. As the largest development project in the City of Marshalltown in more than twenty years, the $700 million dollar facility is expected to bring millions of dollars in tax revenue benefits to Marshall County and to the state of Iowa. The project is generating a number of additional benefits for the local community, including improved quality of existing electric and gas capacity for businesses, industry and the public. The new gas pipeline connecting the existing Northern Border Power pipeline and the Marshalltown Generating Station was sized to meet expected future population growth and increased demand for natural gas in the Marshalltown area. Improving the natural gas delivery system in the city will also lower the long-term delivery cost of natural gas to the community, thereby saving residents and businesses an estimated $1 million annually. Natural World: Alliant Energy, working in conjunction with the project team and local stakeholders, restored a significant portion of the project site to create a new “Nature Trail,” consisting of natural habitats located near the Marshalltown Generating Station. Natural prairie and pollinator habitats replace previously planted monoculture row crops, and the habitats are accessible to the public. The seven acres of new public space provides visitors with the opportunity to learn more about the benefits of natural prairie and pollinator habitats. A walking trail with educational signage is open to visitors daily. Climate and Risk: Alliant Energy completed several detailed studies to understand potential climate change and other risks to the project. For example, the firm undertook a detailed analysis to understand the extent to which the Marshalltown Generating System would reduce greenhouse gas (GHG) emissions from the originally-proposed coal-fired facility that was formerly planned to be constructed in the area. The GHG assessment revealed that the station is expected to reduce emissions by more than 40 percent over a 25-year period. In addition, Alliant Energy conducted an assessment of resource demands and supplies, and resource and infrastructure vulnerabilities. Seven specific risks to the project were proactively identified by the company and intentionally mitigated by the design, including potential shortages in fuel and water resources; flooding and spills; and changes in heat, snow loads, and wind speeds. Ultimately the generating station was designed to be resilient and adaptive to potential changes in the operating environment over the course of its life.